LinkedIn is a great tool for keeping in touch with useful contacts you make throughout your career and even for making new connections who may be able to assist you along the way, so therefore it is important that you give off a good impression when using the network. Saying this, people will always cut corners where they can and this is a particular issue on LinkedIn when it comes to sending invitations to connect with people. Yes, LinkedIn do offer a generic message to be sent alongside your invitation if you wish to do so, but think about it this way, would you approach someone at a networking event without as much as properly introducing yourself? 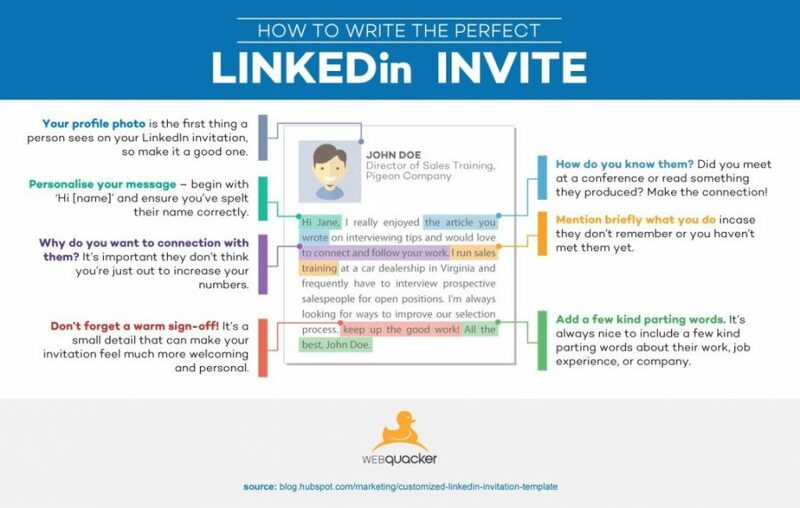 This is why it is crucial that you put the time in to customise your invitation messages on LinkedIn and this infographic by Webquacker explains how to write the perfect connection request. Make sure you have a good quality photograph of yourself on your profile. The person that you are connecting with will build a first impression of you based on this, so make sure it is professional and gives a positive representation of who you are. Selfies, party pics and low resolution photographs are best avoided. Address the individual by name. By beginning your message with ‘Hi [name]’ it gives a more personal feel, rather than giving the impression of you sending out connection requests willy nilly. Just be careful to spell their name correctly as a mispelling will suggest a lack of care. Introduce yourself or explain how you know them. If you’ve met before, chances are that they will remember who you are without prompting, but just in case, it’s always good to remind the individual where you met. Alternatively, you may be sending the invitation because you read their work or would like to do business with them and in this case tell them just that. Be sure to introduce who you are and explain what you do. Explain why you would like to connect with them. People are more likely to accept a connection invitation if the sender has a proper reason for reaching out and is not just looking to expand their network by any means. End on a positive note. Finishing your message with a warm sign-off will make you appear approachable and users are much more likely to accept an invitation with a welcoming tone.